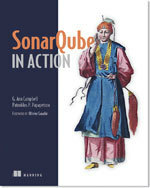 Written by two active members of the SonarQube project, their expertise serves to make this book a trusted reference. The authors share a lot of best practices, showing you how to exploit the tool to make it fit your context. They introduces numerous plugins after each chapter, doing an excellent job of putting them in context. Sonar integration with our CI Server, our IDE, and our security policy is discussed in detail. The book devotes a whole chapter to writing your own plugin. However, the authors only scratches the surface of the topic. A discussion about the SSLR (SonarSource Language Recognizer) and how to make your own custom rules would have been welcome. The only drawback is a book already outdated. The tool continues to evolve (multi-language support, departure from historical tools like PMD, FindBugs, Checkstyle toward the Sonar Way, new look-and-feel, ElasticSearch database to store file contents…). In definitive, SonarQube in Action is not a manual or an administrative guide but a thorough introduction to Continuous Code Inspection with the best Open Source tool out there. I recommend it to any developer, tech leader, or project manager concerned about quality, but still not using SonarQube.